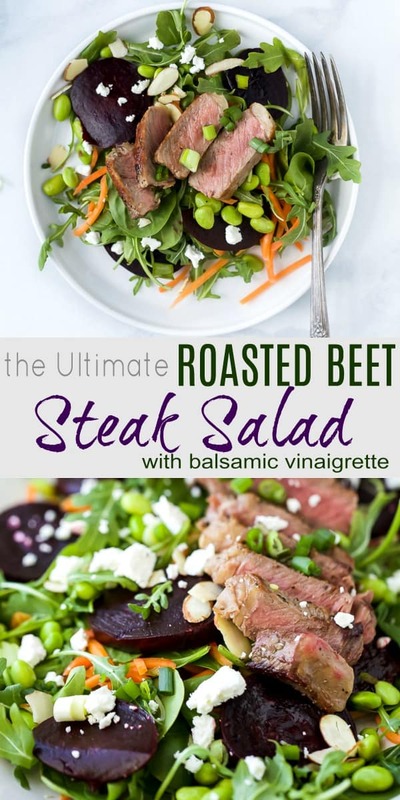 Home » Recipes » Kid Friendly » The Ultimate Roasted Beet Steak Salad in 30 minutes! 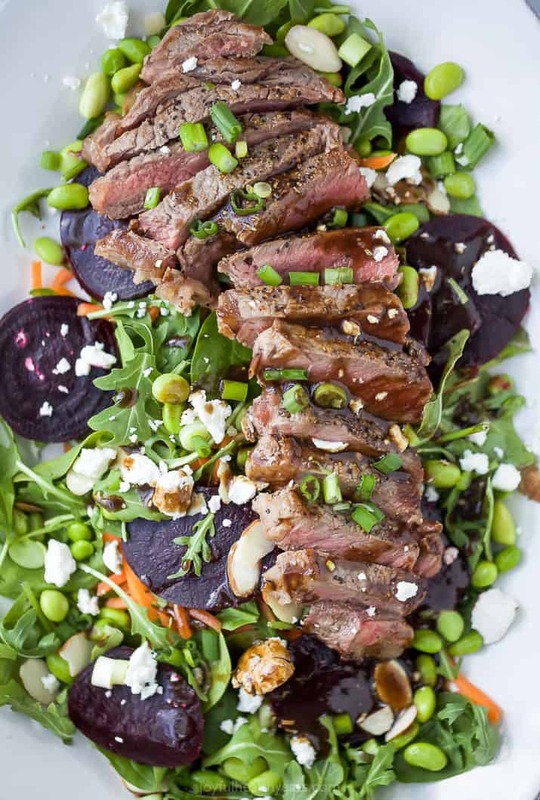 The Ultimate Roasted Beet Steak Salad with Balsamic Dressing. An easy beet salad recipe that’s ready in just 30 minutes! 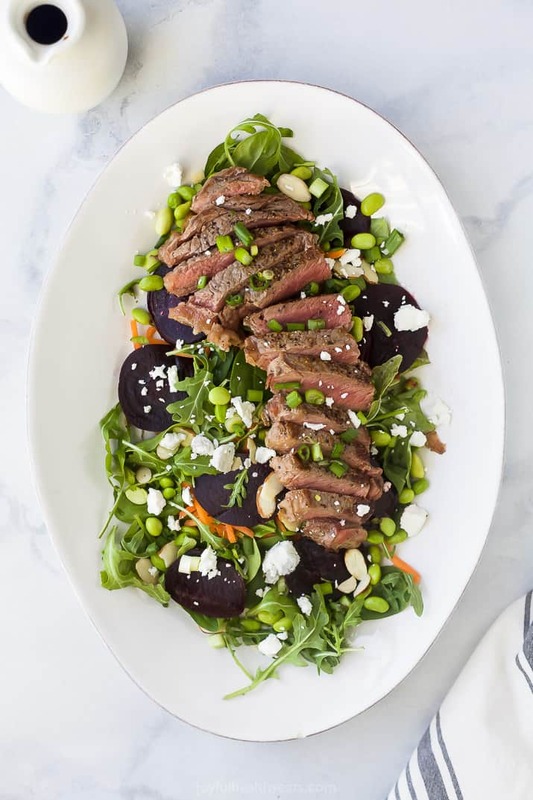 An epic 30 Minute Roasted Beet Steak Salad sure to be a new dinner favorite! 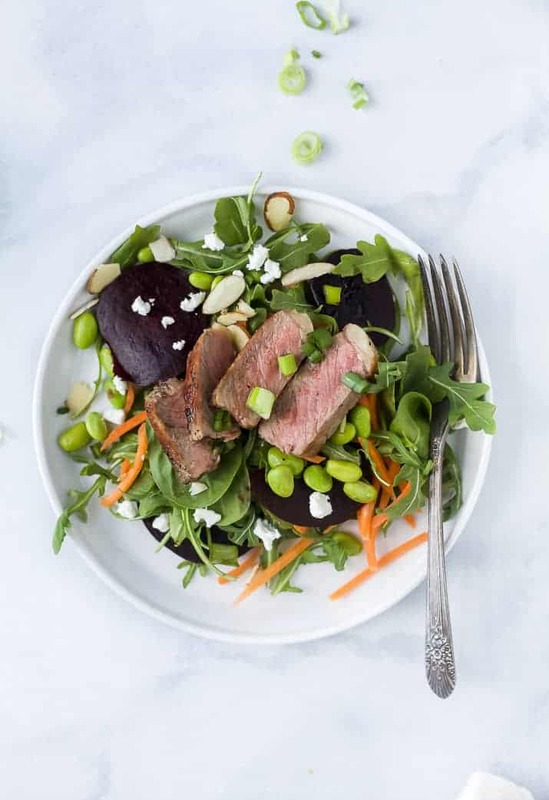 This easy healthy salad is filled with fresh arugula, spinach, goat cheese, edamame, tender beets, topped with seared steak and drizzled with a balsamic vinaigrette. 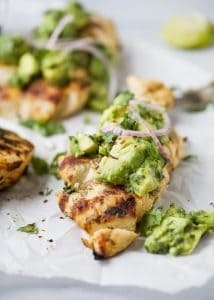 The perfect bite! These days it’s been a little bite more of a struggle. I feel like I have to keep up with all the SEO stuff which has changed the way I write my blog posts to a certain degree. Don’t get me wrong. 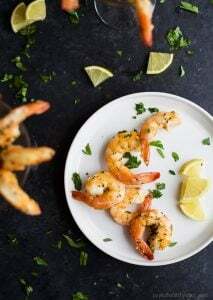 I love giving you guys practical tips and tricks for recipes. Answering your questions has been great, but definitely a change in mindset. Plus, that change has in turn added on “work time” for me when I’m writing posts. These days I find that I show more of “my world” and heart on Instagram more than any place else. 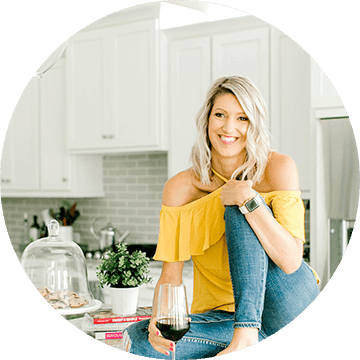 So if you’re not following me there, you need to! It’s honestly how I connect with you guys on more of a heart to heart level, which is what I love! So head over and say hi! Ok, now. Moving on to the real stuff. A couple weeks ago I gave you a recipe for how to make beets in just 15 minutes using your Instant Pot. And can I tell you a secret, I’ve literally used that recipe 4 times in the past week and a half. That is how much we’ve been going through beets lately. It’s unreal! One of the ways I’ve been using up those beets, besides just eating them plain, is by trying to replicate one of my favorite Roasted Beet Salads! You know. The one with the goat cheese, almonds and balsamic dressing on a bed of greens! Except this time I topped it with tender juicy pan seared steak. Because steak makes all things better! 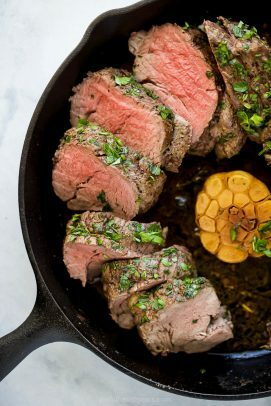 How to Pan Sear Steak? Generously season steak on both sides with salt and pepper. 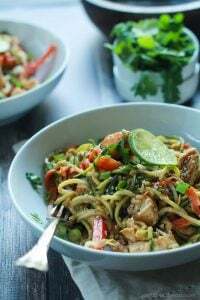 Heat a large cast iron or stainless steel skillet to medium high heat. Add grape seed oil to the pan and add steak. Sear steak for 3-4 minutes per side for medium rare. 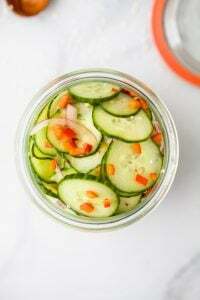 Remove from skillet and let rest on a flat surface for 5-10 minutes per slicing. This allows the juices to redistribute. Greens – leafy greens are a must. Spinach, arugula, green leaf lettuce, kale, spring mix or romaine. Meat – Sirloin, Ribeye, New York Strip Steak, Flank Steak or Filet Mignon. 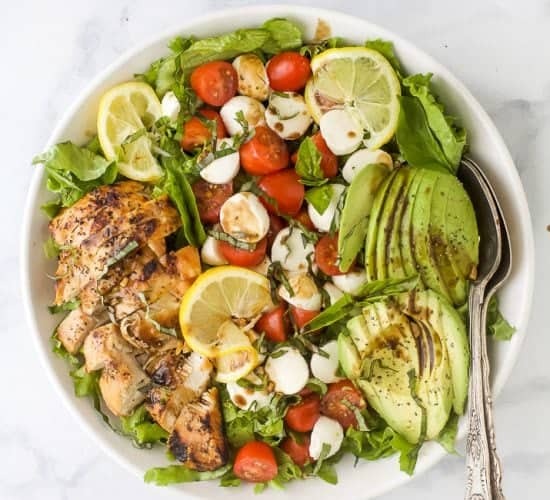 The Produce – roasted beets, tomatoes, green beans, asparagus, avocado, potatoes, cucumber, carrots, onions, red pepper, grilled pineapple, peaches or strawberries. 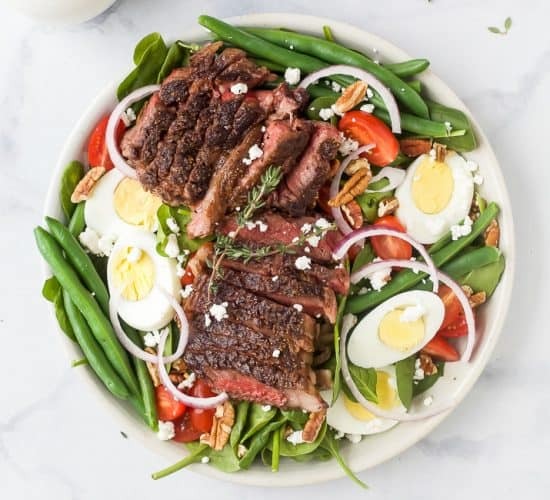 What dressing for Steak Salad? 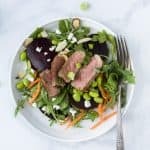 A classic dressing to serve with steak salad is Balsamic Dressing. 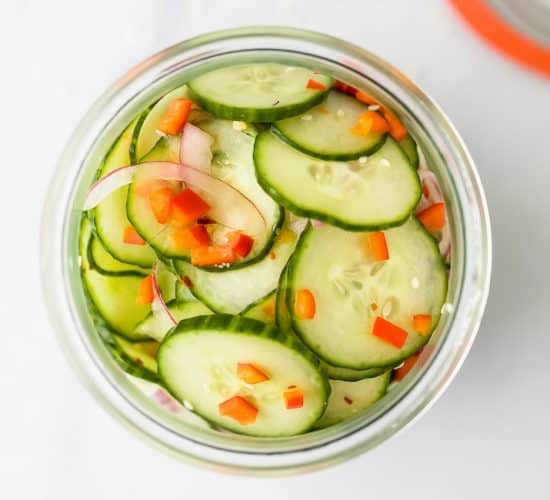 However, other great dressings to serve with steak salad are creamy blue cheese, ranch, chimichurri, homemade honey mustard or even cilantro lime for a fun twist! 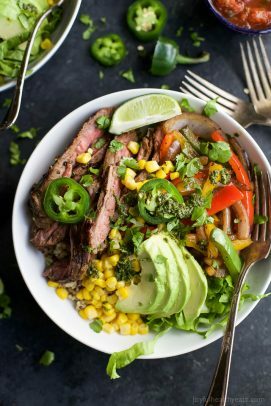 While this version of steak salad has a classic balsamic dressing to it the other ingredients in this salad elevate it! Roasted Beets, Edamame (my curve ball ingredient) grated carrots and green onions give this dish nice freshness and pair awesome with the pan seared steak. The goat cheese adds a nice tangy creaminess and the almonds add some crunch. 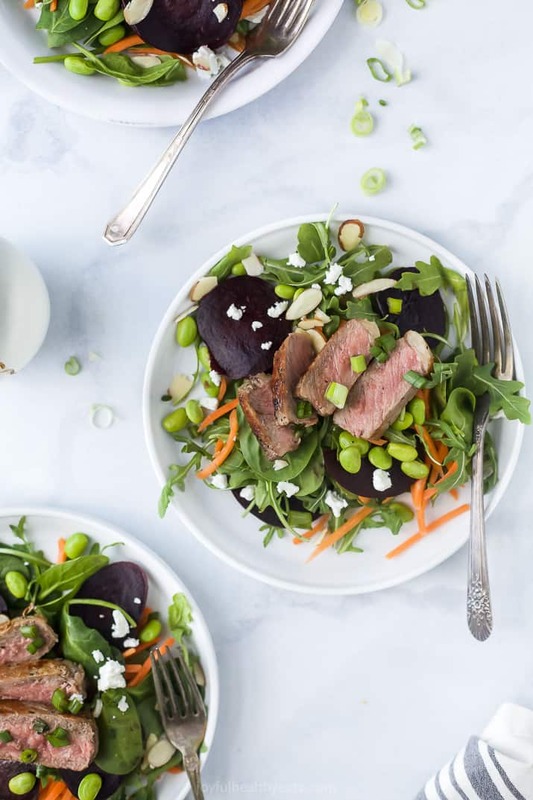 This Roasted Beet Steak Salad is perfectly harmonious with it’s flavor and guaranteed to be a family favorite. My son even devoured this one! 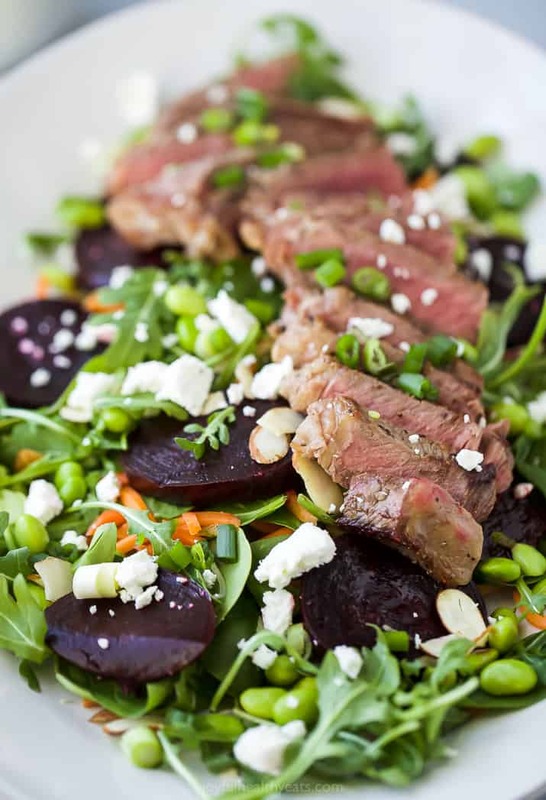 An epic 30 Minute Roasted Beet Steak Salad a new dinner favorite! 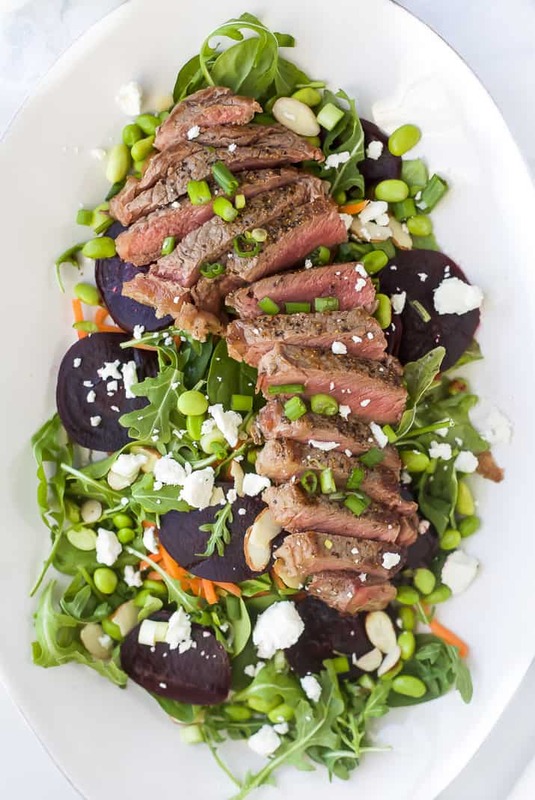 This easy healthy salad is filled with fresh arugula, spinach, goat cheese, edamame, tender beets, topped with seared steak and drizzled with a balsamic vinaigrette. In a small bowl, add stone ground mustard, dijon mustard, honey, balsamic vinegar, olive oil, basil, salt and pepper. 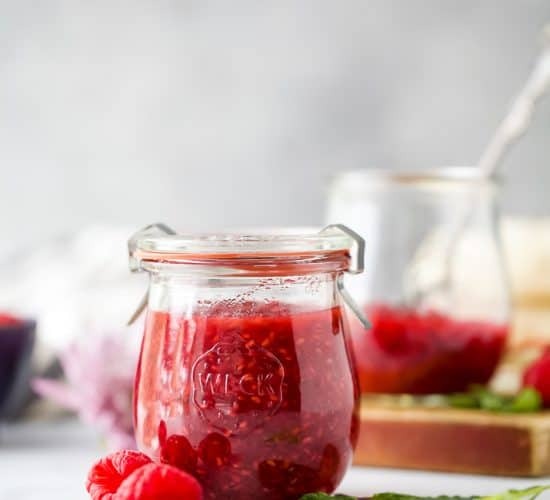 Whisk together until dressing forms or vinegar and oil no longer separate. Set aside. Season both sides of steak with salt & pepper. Heat a medium skillet to medium high heat. Add grape seed oil and then add seasoned steak to the pan. 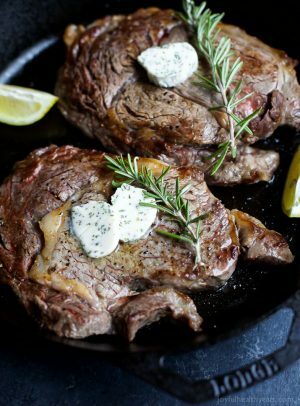 Cook steak for 3-4 minutes on both sides. 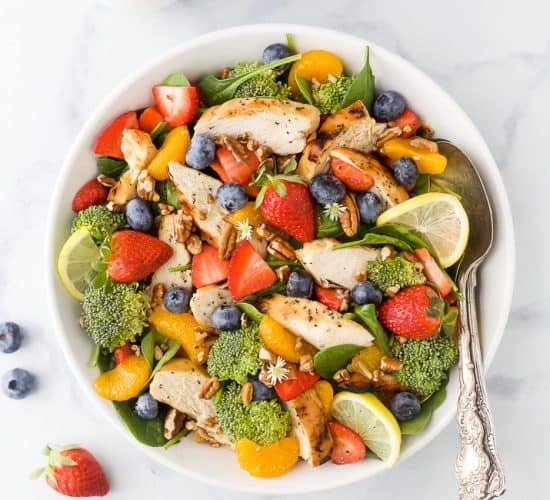 Remove from pan and let rest while you assemble salad. To a large serving bowl add spinach, arugula, edamame, grated carrots, green onions, roasted beets, goat cheese crumbles and raw sliced almonds. 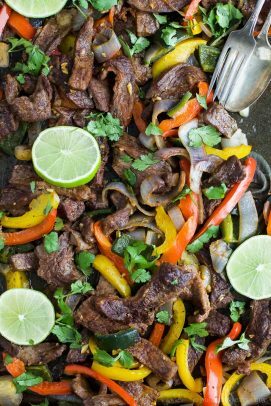 Top with sliced steak and serve with balsamic dressing. Directions on how to cook beets on the stove and on the instapot.